Magdalena Fjällström is an alpine ski girl from Tärnaby who is predicted to become the next Anja Pärsson.2014 she won the silver medal in the Swedish Championships and since earlier she has a junior gold from both the 2012 Olympics and the 2013 World Cup. When she isn’t wearing her skiing boots she proudly wears her Bynäbbar. 1995 yet another alpine ski star from Tärnaby was born, Magdalena Fjällström. As early as three years old, she stood on skis for the first time. Today, 16 years later, her passion and hard work has given results. In 2010, she won the gold medal in the 2012 Swedish Youth Championships, gold medal in the 2013 Youth Olympic Games, gold medal in the 2013 Junior World Championships, took 13th place in the 2013 World Cup and silver medal in the 2014 Swedish Championships. - Winning the Junior World Championships 2013 was incredibly awesome. I was still a younger junior, which means that I had to compete against those who was three years older. That day everything felt just right for me and the feeling of bringing the gold medal home was really nice, Magdalena says. 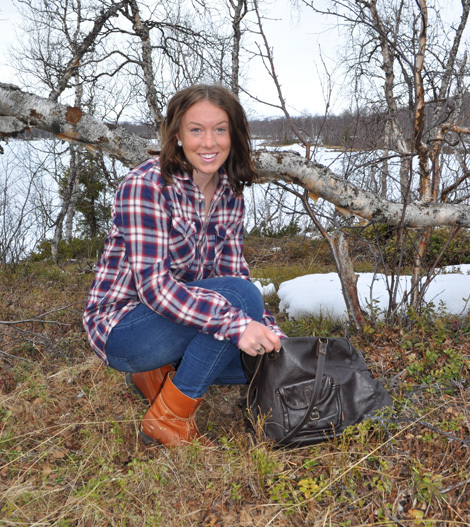 Growing up in Tärnaby, with proximity to nature, the natures way always played a big role in Magdalena's life. The food she’s eating comes from the forest and the socks that’s warming her feet is knitted by her mother. Therefor she felt a connection to Kero. - I saw on Keros website that they had a club for ambassadors where you could apply for membership. I became very interested and immediately sent in an application. Today I am very proud to be a Kero ambassador and I love to show the world their fine products. What I appreciate most about Kero’s products is that they are so nice and well made. My big favorite is Bynäbben,it fits to almost everything. It is really perfect for my life because one day I will visit the television morning show one day and the next I take a flight to the snowy Alps, Magdalena explains. When Magdalena spans of her skiing boots and the skiis are stored, she tries to relax and think away the skiing. She likes to be outdoor and spends happily her leisure time with snowmobiling, fishing and motocrossing.